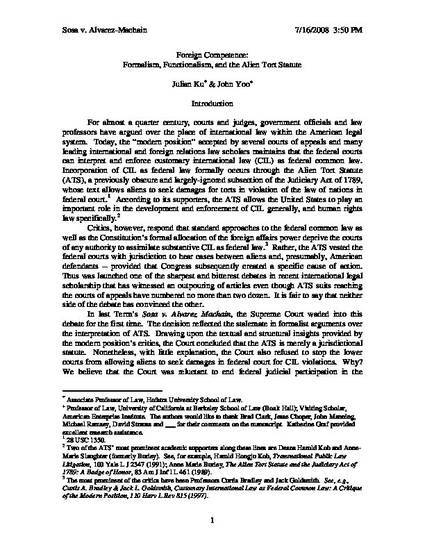 This paper discusses the functional ability of federal courts to incorporate customary international law (CIL) through the vehicle of the Alien Tort Statute. In last Term's Sosa v. Alvarez Machain, the Supreme Court concluded that the Alien Tort Statute (ATS) is merely a jurisdictional statute, but also refused to stop the lower courts from allowing aliens to seek damages in federal court for certain international law violations. We use the Court's under-theorized conclusion as an opportunity to move beyond largely inconclusive formalist debates about the ATS's text, structure, and history. Instead, we conduct a comparative institutional analysis of the role of the courts and the executive in foreign affairs. This functional approach suggests that the executive branch can more effectively achieve the purpose behind the ATS. Critics of this approach have argued that a jurisdictional approach to the ATS would disrupt American foreign relations by allowing the states, rather than a single federal judiciary, to make and enforce CIL. The Court's recent decisions, however, address this concern by permitting presidential declarations of international policy to preempt state law. Thus, CIL could continue as part of the common law of the states enforceable in state court or through diversity jurisdiction in federal court subject to federal preemption by the President.